The publication of Laudato Sí—a papal encyclical on a defining issue of our times-was a moment of great importance for Catholics and for the world. Now Fr. Joshtrom Kureethadam, one of the church's top experts on the document, provides a thoughtful, passionate, and highly accessible commentary on its key ideas and themes. Faithfully attentive to the outline of the six chapters of the encyclical, Fr. Joshtrom has also insightfully arranged the book according to the see-judge-act methodology that is increasingly used in spirituality, moral theology, and the social sciences. If Pope Francis is right when he insists that the solution to our environmental problems cannot be found only in technocratic approaches by governments and institutions, but by a wide and thoughtful embrace by all of us of our common responsibility, then Fr. Joshtrom's book is precisely what we need at this time. Joshtrom Isaac Kureethadam, a Catholic priest, serves on the staff of the Vatican's recently created Dicastery for Promoting Integral Human Development. Prior to this work, he was professor of philosophy of science at Rome's Pontifical Salesian University. His previous book is Creation in Crisis: Science, Ethics, Theology. Fr. Joshtrom Kureethadam has written a powerful and transformative book. 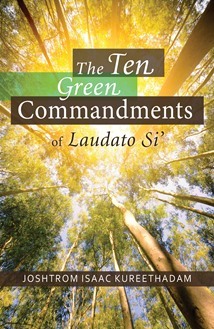 The Ten Green Commandments will ignite a radical environmental effort. He uses elegant words and a graceful style to open our hearts and rekindle our reverence for all living systems. His insight, warmth and care for humanity is very compelling and supports the important scientific facts that are the basis for Laudato Si'." Fr. Kureethadam has provided an invaluable guide to the spiritual and theological vision of Laudato Si'. He also shows how ordinary Catholics can turn this vision into a personal action plan for assuming ecological responsibility. A clearly written and deeply challenging volume. This is one of the clearest commentaries that I have read on Laudato Si'. The author stays faithful to the original text and manages to distil and even clarify its essential message with some carefully chosen examples, while not losing nuance. If anyone is in any doubt that questions to do with ecology are bound up with issues of poverty and marginalization, they should read this book. Yet, this author does more than just give information, this book is inspiring to read, and echoes the same combination of depth and spirituality that Pope Francis so wonderfully illustrates himself.